conveys visual information from the retina (special afferent). Visual information enters the eye in the form of photons of light which are converted to electrical signals in the retina. These signals are carried via the optic nerves, chiasm, and tract to the lateral geniculate nucleus of each thalamus and then to the visual centers of the brain for interpretation. Light passing through the cornea and aqueous humor and entering the pupil travels through the lens and vitreous body to reach the retina at the back of the eye. The regions of the retina are referenced to the midline. The nasal hemiretina lies medial to the fovea, while the temporal hemiretina lies lateral to the fovea. The superior and inferior halves of the retina are also referenced to the fovea. 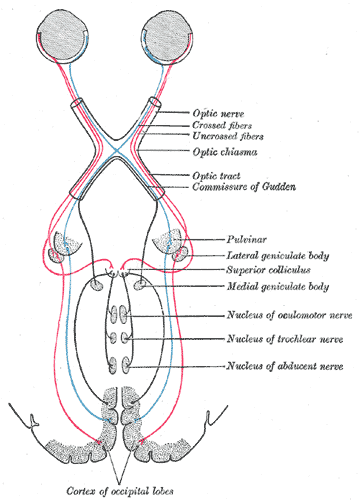 Axons of ganglion cells from the nasal hemiretina (lateral visual field) decussate at the optic chiasm and project to the contralateral lateral geniculate nucleus and midbrain. Axons from the temporal hemiretina (medial visual field) remain ipsilateral throughout their course. Axons from the inferior half of the retina (upper visual field) project via the Meyer's loop/temporal lobe portion of the optic radiation to the primary visual cortex below the calcarine fissure. Axons from the superior half of the retina (lower visual field) project via the parietal lobe portion of the optic radiation to the primary visual cortex above the calcarine fissure. Ganglion cells from the center of the retina (fovea) project to the tip of the occipital pole. knowledge of this visual system anatomy predicts the deficits associated with a lesion at a particular point in the central visual pathway. Results in a loss of input from the affected portion of the retina leading to a monocular field deficit. Since axons of the ganglion cells converge toward the optic disc, damage to a portion of the retina closer to the optic disc will affect a greater number of neurons than would the same amount of damage in the peripheral retina leading to a larger visual field defect in that eye. Since the cones are concentrated in the fovea, damage to the fovea results in a greater visual handicap than damage to peripheral regions of the retina. Results in a monocular visual defect due to loss of input from the ipsilateral eye. The patient will complain of blindness in that eye. compromise the decussating fibers from both nasal hemiretinas. The loss of peripheral vision in both eyes is called bitemporal hemianopia. affect the fibers of the ipsilateral temporal hemiretina (nasal visual field). Because half of the ganglion cell axons projecting to the lateral geniculate nucleus decussate in the optic chiasm, damage posterior to the chiasm results in loss of input from the contralateral visual fields of both eyes. Results in loss of the contralateral visual fields in both eyes (homonymous hemianopia). Fibers of the optic radiation are considerably more spread out than those of the optic tract. As a result, damage normally only occurs to a portion of the geniculocalcarine tracts. Damage to the fibers of Meyer's loop and/or damage to the temporal lobe portion of the optic radiation results in loss of input from the inferior half (superior visual field) of both contralateral hemiretinas (superior quadrantanopia). Damage to the fibers of the parietal lobe portion of the geniculocalcarine tract results in a loss of input from the superior half (inferior visual field) of both contralateral hemiretinas (inferior quadrantanopia). Often lesions in the optic radiation or primary visual cortex do not produce a complete loss of vision from the appropriate visual field but leave some central vision intact. This is due to the fact that input from the center of the retina (the macula) is spread over a large portion of the optic radiation and primary visual cortex. For example, damage to one side of the primary visual cortex below the calcarine fissure will often produce loss of vision from the inferior half (superior visual field) of both contralateral hemiretinas with macular sparing (superior quadrantanopia with macular sparing). some fibers enter the pretectal region of the midbrain and participate in the pupillary light reflex.